A Wonderful Spring Wedding Fair at The Old Parish Rooms! Well we were back at The Old Parish Rooms, Rayleigh on Sunday 19th February for the Rock the Day Styling wedding fair and what a great day we had! Met some lovely new suppliers and caught up with some old faces (not literally of course! ), and also met the lovely Laura Celiz from RTDS who ran the Fair so well and brought me copious amounts of coffee! Thank you Laura. Very much appreciated. The Old Parish Rooms is such a gorgeous venue, so bright and airy, with lots of quirkiness, ideal for an intimate wedding. We met lots of lovely couples planning the biggest day of their lives and our Cookies and Cream cake went down a storm! One of the most popular cakes we had on show was our Naked Wedding Cake, which isn’t surprising as it looks stunning against the backdrop of such an amazing venue. 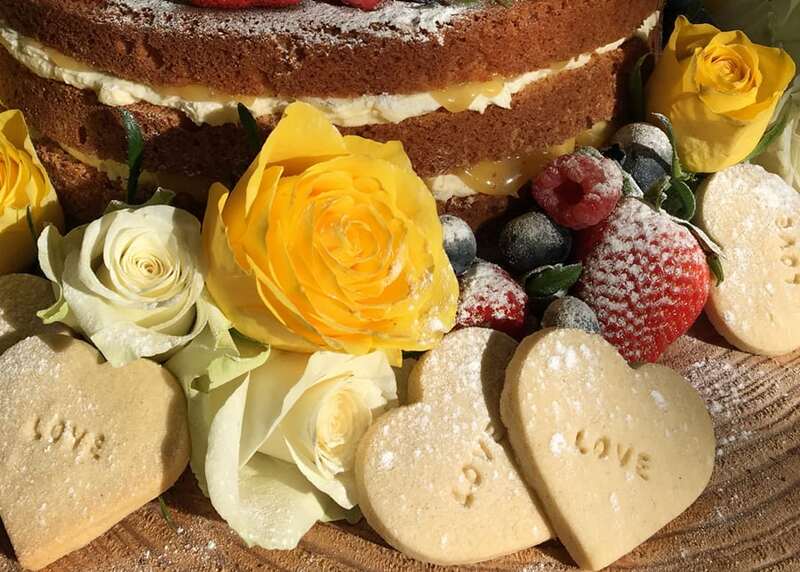 This time it was decorated with not only fresh berries but also fresh flowers and cute heart shaped vanilla cookies… all bells and whistles if you like! We displayed three sweet mini Victoria Sponges alongside, again decorated with berries, flowers and cookies, it really did look scrummy! Our next wedding fair is at the Roslin Beach Hotel, Southend on Saturday 18th March which runs from 10am – 4pm. We will, of course, be supplying samples of cake for you to enjoy and lots of gorgeous cakes on display. See you there!